Cute is just one word to describe the online scratch card website. Choose from a wide selection of cute and friendly casino games and scratch cards. 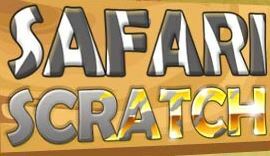 Safari Scratch has their own VIP club and are hosting several types of casino tournaments for their players. They are usually pretty basic when it comes to the welcome bonus that they offer. Its sometimes a free scratch card that can be offered to new players. However they do have some promotions each month where other types of valuable bonuses can be collected. As the welcome offer it can also be free spins instead of scratch cards sometimes. They actually have a lot of slots games. Its easy to think that its mostly scratch cards but its lots of other things as well, like slots, roulette and lots of other basic casino games. Safari Scratch also has a mobile casino. You don’t have all the games there as in the regular casino but its still some of the more popular games that can be found there. It works on both mobile and tablets. The support can most easy be contacted through the live chat option. You just click the live chat button in the top right corner and fire away your questions. There is also a telephone option, fax option and email option, so plenty of choices if you need to contact them. Of course there is also a FAQ available as well where you can look at the most common questions and answers. The online website is licensed and based on Malta. The support can be reached on a live chat directly on Safari Scratch website. Neo Game is the platform that Safari Scratch is based on.